It’s October and most of the summer and fall projects and river trips etc. are over time to get serious about this chess globe or forget it. I thought a lot about how to build this globe over the summer and thought I knew how I was going to do it, then I started on it and there were changes on the fly every day I think. My neighbor is a very good wood turner and does a lot of large bowls, live edge, green etc. I was talking to him and he told me he was getting a new lathe a larger one about a 16” swing. The light came on and I told him about this chess globe. He said he would be more than happy to let me use his lathe. With a big lathe available I am going to have to vanish this. I ended up with the block above. Before I could get to that stage I had a lot of prep and thought. a chess board has 64 square and I’m going to make two of these. How am I going to get the chess pieces to stay on the globe? Magnets 64 magnets in each globe and 64 magnet in the chess pieces. That’s 192 magnets and one magnet put in opposite polarity and I have real issues especially if it is inside the globe. Then there is the cost of the magnets. If I put steel washers in the bottom of the chess pieces no polarity problems. Now I only need 128 magnets. Let’s get some magnets. How strong do they need to be? I get on line and find some 1/2’ d x 1/4’ h rare earth magnets with about 12lbs pull. I order 10 (smallest number I can order). How thin does the wood need to be for them to hold. I found that the magnets would hold a washer fairly tightly thru 1/8” of wood. These magnet will probably work. How do we get them within 1/8” of the surface of the globe? It hit me about this time if I put steel washers in the globe and the magnets in the chess pieces I would only need 64 magnets. (procrastination pays off sometimes). The first thing I did was dry clamp one of the center layers then lay a 10” circular template on it centered it as best as I could and draw around it. With calipers I measured from inside edge to the line of the circle subtracted about an 1/8” and drilled a hole in the pieces about that deep. 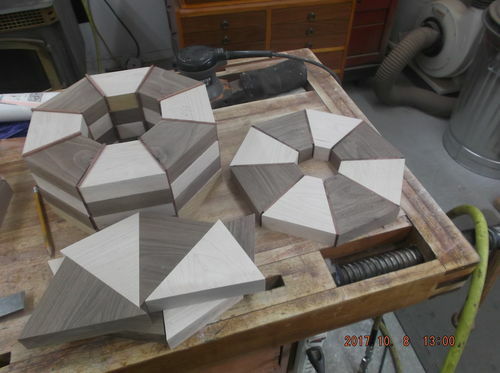 I then droped a couple of washers in each hole pured some epoxy in each one and let them cure then glued the layer up, ran it thru the drum sander, glued a layer of bubinga on and sarted stacking the pieces. The layers above the center two were a lot more guess than accurate measurement. 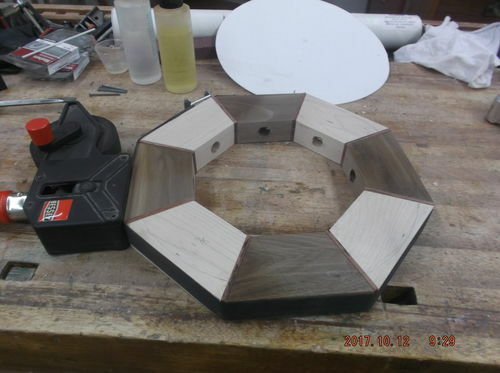 When I glued up the fir mockup I had recoreded the length of the pieces in each layer. I was able to use this original measurement to cut my wedges to length then lay them on the fir piece draw a line on the wedge showing the position and shape of the angle from that line I could make a guess as to how deep and the angle to drill the hole at. I kept drawings of the angle in the piece and the depth of the hole for each layer so I had something to make changes from if needed on globe three and any others if necessary. Once everything was glued up it was time to see the neighbor and his lathe. That block of wood is heavy. The neighbor when he set up his lathe put a box with 600 lbs of sand as ballast under it. That is going to make a difference. 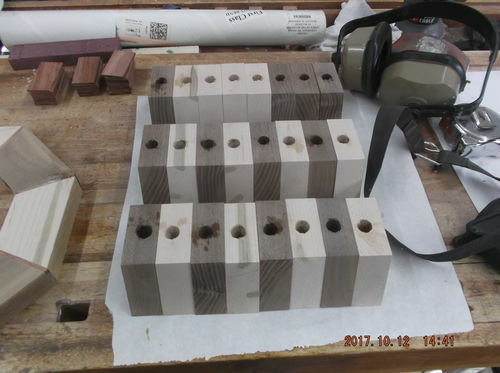 I don’t have a picture of that block in the lathe before turning. 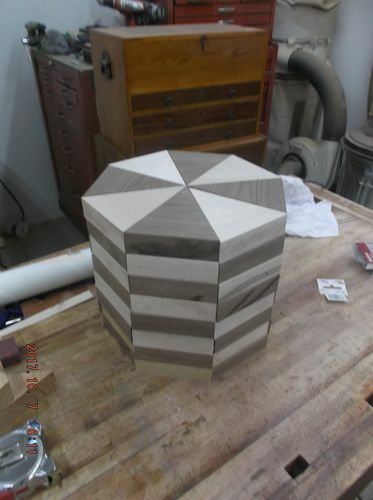 Try to imagin a bloc 11” in diameter and approx 11” tall almost solid wood. Looks great. I don’t think you should be intimidated by the size of the turning blank as long as it is securely mounted. It should turn pretty smooth right from the start. Since it is a glue-up with even weight distribution it should be pretty well balanced.